This modern hotel, located in the theater district, offers comfortable and affordable accommodations within walking distance to many New York attractions. The Belvedere offers 400 guest rooms, all with wireless Internet access, a marble bath, and an in-room safe. Some rooms also include a kitchenette. Expect to pay from $150 per night. Perhaps the best cheap New York Hotel, the Comfort Inn, located in the city's theater district, offers comfortable and clean rooms starting at around $100 per night. 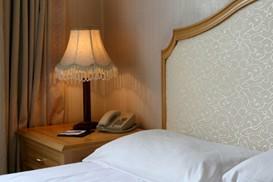 Room rates include a complimentary breakfast, wireless Internet access, and free local calls. This Murray Hill residential hotel offers studio, one-bedroom, and two-bedroom apartments at affordable rates. Each suite includes a fully-equipped kitchen, cable TV, wireless Internet access, and a VCR, a DVD, and a CD player. Guests also have access to a range of services and facilities including a health club, housekeeping, a concierge, a pet attaché, and laundry and dry-cleaning services. Rates start at $170 per night. Located at the southern tip of Manhattan near the South Street Seaport, the Best Western Seaport Inn is an ideal spot from which to explore lower Manhattan sights, such as Wall Street, Greenwich Village, and Ground Zero. The inn's 72 rooms include free wireless Internet access and start at around $160 per night. New York City offers a wide selection of hostels - affordable, non-frills accommodations. Among these is the Big Apple Hostel, a 130-bed midtown facility, offering dormitory-style accommodations for around $30 per night.